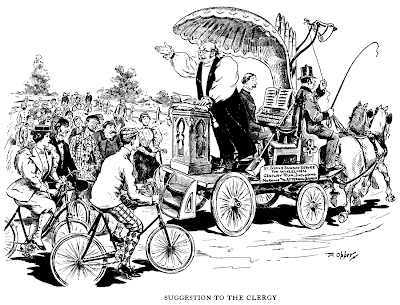 The Shriner's convention is winding down, but Herriman is still in there plugging away with his daily cartoons. 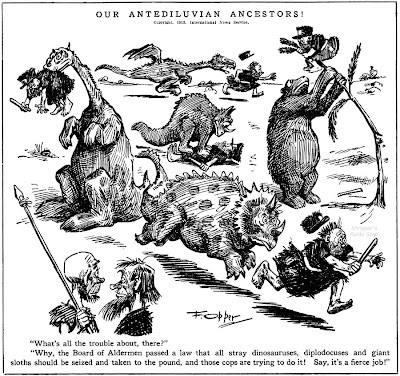 These were published on May 10 and 11 1907. I supplied a great many Opper cartoons that didn't find their way into the book, so here's a potpourri of bonus Opper items for you. 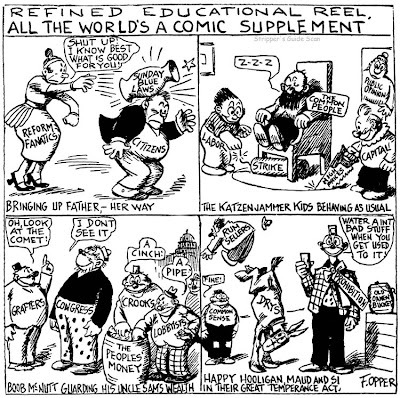 Today we have three from Opper's Puck days, when he used a very refined style completely different than the one he used for newspaper strips. 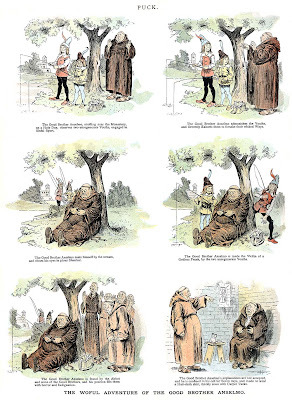 These three Puck cartoons are all satires on religious themes, a favorite subject for Opper in his days with that magazine. 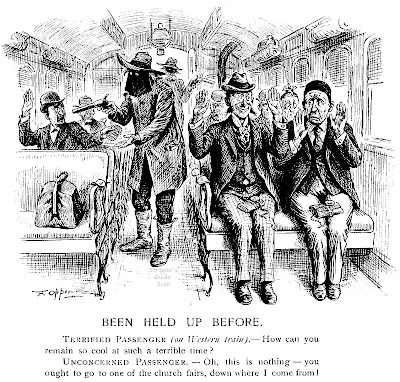 Opper curtailed such cartoons when working for Hearst. I supplied a great many Opper cartoons that didn't find their way into the book, so here's a potpourri of bonus Opper items for you. 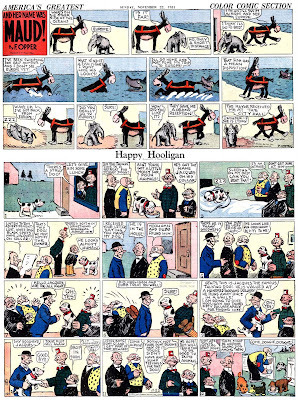 At the top we have a Happy Hooligan page from near the end of Opper's career, 1931. Although many say that he was well past his prime and the art was no longer any good, I've always liked Opper's later work as a study in expressive minimalism. 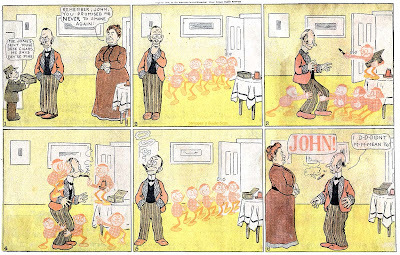 Next we have an experimental strip from 1906 called The Red Rig-aJigs. This short-lived feature starred a cast of gremlins delineated only by a ghostly red tint. 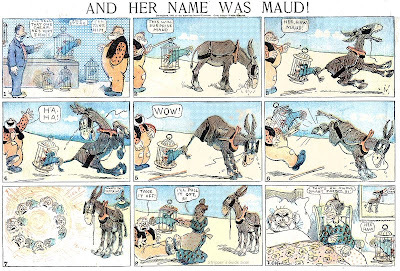 Finally we have a 1905 And Her Name Was Maud strip, Opper's second most famous feature after Happy Hooligan, and a 1910 Howson Lott strip, a comedy about a city fellow who moves to the country. 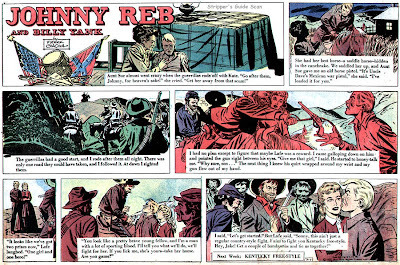 Johnny Reb and Billy Yank has the distinction of being the very last new feature to be produced in the full page format. 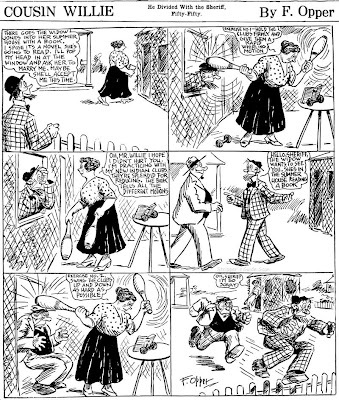 The Sunday only strip debuted in the New York Herald-Tribune on November 18 1956, beautifully drawn to take advantage of its vast acreage by Frank Giacoia. The strip initially told the tale of a pair of soldiers, one each in the Civil War's Union and Confederate armies. The story was well-researched and according to Ron Goulart, was a joint effort between Giacoia and Herald-Tribune editor Ben Martin. The concept of following the two separate stories might have seemed like a good idea, and would have been in a novel, but the weekly comic strip doesn't lend itself well to such literary devices. 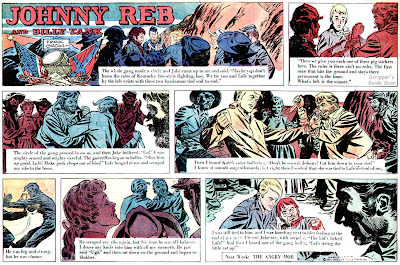 The schizophrenic strip eventually settled down to primarily tell Johnny Reb's story, and was better for it. 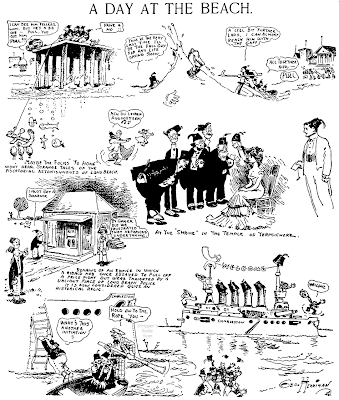 The glorious full page version of the strip was last printed by the Herald-Tribune on September 22 1957, after which the strip was available only in the conventional half- and third-page formats. 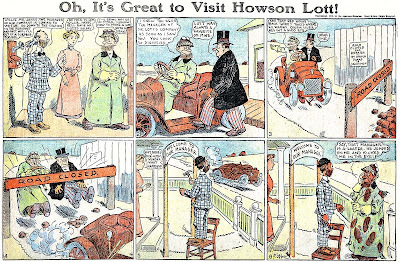 The strip wasn't selling well, a common problem at the H-T -- many excellent strips have foundered in obscurity for no other reason than having the misfortune of being picked up by that syndicate. Giacoia was evidently having trouble keeping up with deadlines on the strip, probably because he couldn't afford to devote much time to it considering how little revenue it was bringing in. The embattled Giacoia enlisted help on the strip from various quarters -- we know that Jack Kirby's hand is evident on many a strip, and it looks to me considering the ever-changing quality of the art that many others were called on to help. I think that someone skilled in art-spotting of 1950s comic book artists would have a field day with this strip. It finally became obvious that Johnny Reb and Billy Yank was simply not going to catch on, even with Southern papers that should have been clamoring to add it to their Sunday sections. The story was brought to a close on the Sunday of May 24 1959. It was only one of a long string of victims of the H-T's preternatural inability to sell its fine wares. It's not as if Giacoia did so much else during those years. I know of one western story he did Timely/Atlas, which was pencilled by Kirby. And he must have done some stuff for DC. Giacoia was an inker who could draw and he loved working on someone else's pencils. All of the Kirby pages are on view at the Jack Kirby Museum (if you join). I hope to show more of the others later but want to wait until I have a run whoch can be read. As for other pencillers, my guess is Mike Sekowsky would be one. He also aided Giacioa on his previous effort, Sherlock Holmes. 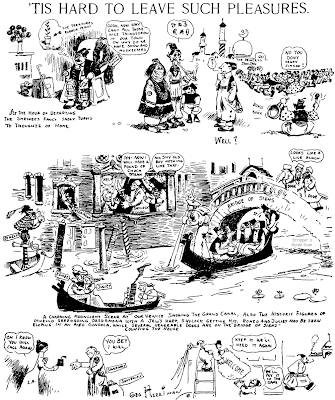 Another very well drawn strip which suffered immensely from the fact that the sunday usually was very little more than a recap of the weeks adventures. To make this a Sunday only seems like a smart thing. Sekowsky (who unlike Giacioa ould pencil art an insane speed) also worked on Flash Gordon in these same years. So Giacoia wasn't doing comic book work at the time? That's what I assumed. As I said, he must have been doing stuff for DC, but never as much as his peers, such as Mike Sekowsky, Carmine Infantino, Sy Barry, Gil Kane and Joe Giella. 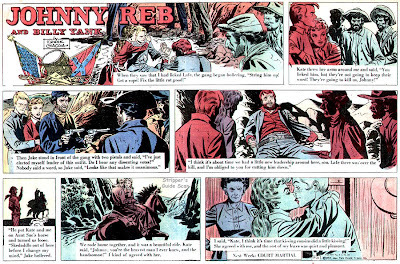 Pencillers listed as helping Giacoia on Johnny Reb include Gil Kane, Joe Giella, Sam Burlockoff, and Joe Kubert. It is my understanding that Giacoia was a fine penciller but a blank page somewhat confounded him and set in his natural tendency for procrastination; so his many comic artist friends assisted him by laying out the pages. By the way, the kirbymuseum.org follows your three strips by reproducing the July 28, 1957 through February 2, 1958; including the September 22, 1957 strip in both half- and full-page formats. Those pencillers listed as assisting should also include the aforementioned Mike Sekowsky and Jack Kirby. 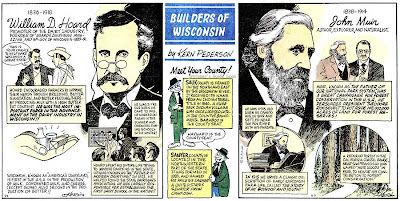 There's a whole laundry list of state history cartoon features, and Builders of Wisconsin was pretty typical of the genre except that unlike most it ran in color in the Sunday comics section rather than in black and white. 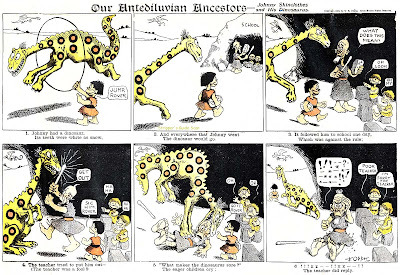 The feature was by Kern Pederson, who is at least slightly better known as the creator of Little Farmer, a long-running weekly strip of the Al Smith Service. The Sunday feature appeared in the Milwaukee Journal from October 22 1972 to sometime between May and October 1973. If it appeared anywhere else I'm unaware of it. A close look at the examples above reveal that the feature may have run as more of a daily style-panel at some earlier point -- notice that there are two numbered panels per Sunday episode. I've not found the feature running in that configuration, though. One additional note -- don't blame Pederson for using such a muted and repetitive color palette on his feature. 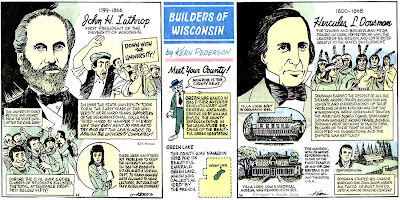 The Milwaukee Journal's whole Sunday comics section looked like this in the 1970s. Although they were definitely employing a 4-color press all the colors were washed out. I don't know if they were using cheap inks or what, but the whole section looked awful. Although I'd heard the story before, it's pretty impressive that Herblock suggested Jim for the position. 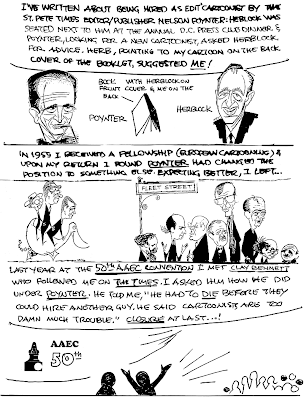 Herblock was the first political cartoonist I knew by name. As always, thanks to Jim for creating his "Sunday Comics" and to Alan for posting them!